To boost business online, it is necessary to adopt the latest technological advancements. To hire the best PSD to HTML conversion service provider, it is an important step towards the responsive website. This is the digital age, where billions of people are utilizing the internet. People use internet for communication, shopping, marketing, and various other purposes. Today, every business wants an intuitive, attractive, and responsive website on the internet to gain more customers. Thus, it is necessary to hire the best professional service provider to accomplish all your business goals. And, it is great to see that most of the website owners have started understanding the value of becoming responsive and also adopting current trends in mobile technology. Mobile friendliness has become one of the crucial factors for sites to get top ranking with major search engines. Creating amazing websites is not an easy task. 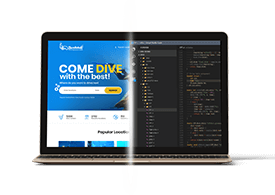 In this way, the most popular PSD to HTML conversion is one of the best options to build fully-functional and feature-rich websites that function properly on both desktop & mobile devices. You can get cross-browsers & devices compatible, seamless integration with any CMS, fast loading sites, and different dynamic functionalities by opting PSD to HTML services. However, it is equally important to find an appropriate PSD to HTML conversion service provider who will play an important role in your business success. It is the most important factor to know that whether the agency has a skilled & well-experienced team of designers and developers. They should be able to understand your requirement and must be able to deliver the project within the set timeline. That particular company should follow advanced technologies and semantic coding practices in order to stay ahead of your competitors. Make sure your website should be compatible with different browsers and devices. There are relevant past projects of PSD to HTML conversion will tell you the full story. However, sometimes companies mention fake details just to attract the clients. So, conduct face-to-face meeting and analyze their experience & skills in web development industry. A company that worked with big brands may be a good choice to work with. Also, they should have experience in all frameworks and CMS including HTML5, CSS, Drupal, Magento, WordPress, etc. According to their portfolio & expertise, you can easily select the best PSD to HTML conversion services. Technical evolution is another important step in this process. A professional organization should involve the W3C guidelines which mean the developers would create a site that runs smoothly on all the browsers and users can easily access the website. Utilization of quality-wise validated coding like HTML markups and CSS codes according to rules of semantics that result in clean and validated coding is crucial for the success of your project. All the developers of that particular company should be well-versed with HTML coding standards and integration with other technologies. Clients feedback and reviews are important assets that will determine their true experience & expertise. You can get a complete idea about their services and quality work which they delivered to their previous clients. Go to their website review section and check the feedback. Past feedback work will surely help you in deciding the right PSD to HTML conversion service provider. With quality work, company also needs to provide cost-effective services. They should meet your costing budget in order to complete the project successfully without delay. Initially, it may be difficult to tell what price is suitable but if you will put efforts wisely you can definitely get genuine PSD to HTML service provider and affordable services too. Also, check if they have a money-back policy. It is recommended to get a complete estimate for conversion service before moving ahead and there will be no hidden costs involved in it. Are they capable to complete your project within time? Ask them about the estimated time and set deadlines to finish the project. Otherwise, you will have to suffer because of longtime delivery of the project which can result in the loss for your business. You need to make sure that they are committed about the specific time and can deliver a project with high quality. Before processing to hire PSD to HTML conversion service provider, you need to make sure that your project data should be in safe hands. The above-mentioned steps can help you to find the best PSD to HTML conversion company that results in more profits and success for your business. How The IoT App Development Can Play A Vital Role In The Mobile Technology?